Infineon Technologies has expanded its Silicon Carbide (SiC) MOSFET family with the new 1200V CoolSiC MOSFET Power Module. These MOSFET utilizes the properties of SiC to operate at high switching frequency with high power density and efficiency. Infineon claims that these MOSFET could exceed an efficiency of 99% in inverter designs because of its lower switching losses. This property reduces the operating cost significantly in fast switching applications like UPS and other energy storage designs. The MOSFET Power module comes in a Easy 2B package which has a low stray inductance. The new device widens the power range of modules in half-bridge topology with an on-resistance (R DS(ON)) per switch to only 6 mΩ making it ideal for building up four- and six-pack-topologies. Additionally, the MOSFET also has a lowest gate charge and device capacitance levels seen in 1200V switches, no reverse recovery losses of the anti-parallel diode, temperature independent low switching losses, and threshold-free on-state characteristics. The integrated body diode on the MOSFET provides low-loss freewheeling function without the need of an external diode and the integrated NTC temperature sensor also monitors the device for failure protection. The targeted applications for these MOSFETs are photovoltaic inverters, battery charging and energy storage. Because of their best performance, reliability and ease of use it facilitates system designers to harness never before seen levels of efficiency and system flexibility. 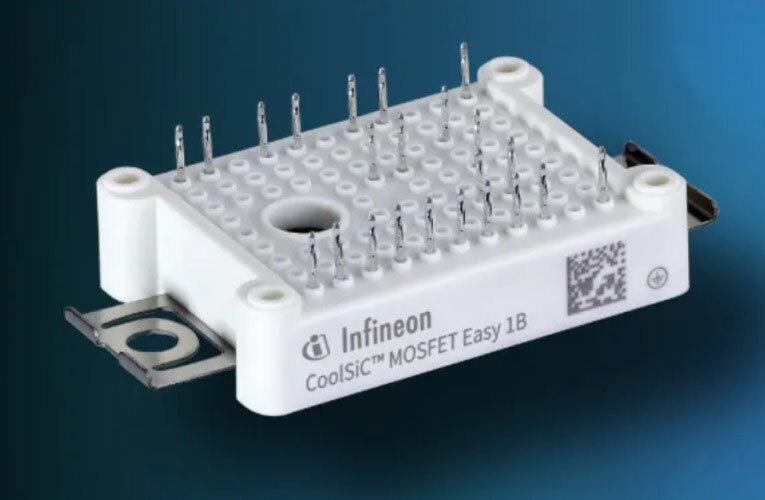 The Infineon Easy 2B CoolSiC MOSFET are now available for purchase you can visit their website for more information.